A decade ago we began documenting online a very strange case of misattribution regarding the work of 19th century commercial photographer Thomas J. Nevin for the Colonial Government of Tasmania, specifically his provision of prisoner mugshots taken in the 1870s of habitual offenders convicted at trial, returned on arraignment, or discharged from various sites of incarceration: the Port Arthur Penitentiary, the Supreme Court Hobart, the Hobart Gaol (Campbell Street), and the Mayor’s Court at the Municipal Police Office, Hobart Town Hall. The extraordinary marker in this case of photographer misattribution is the recent proposition that an individual called A H. Boyd, Commandant of the Port Arthur prison from 1871 to December 1873 was the photographer of at least 83 estrays from thousands taken by Nevin in Tasmania in the 1870s, Those 83 estrays held in a collection at the National Library of Australia, Canberra, were accessioned and exhibited in T. J. Nevin’s name in the 1970s-1980s at the NLA, which the NLA has since re-catalogued as “Convict Portraits, Port Arthur 1874” with A. H. Boyd’s name as the “creator”. But Boyd had no photographic skills, training, knowledge or official mandate, and no known extant photographs when reputable historians in the decades 1970s-1980s researched and mounted an exhibition of these prisoner photographs as the work of Thomas J. Nevin (QVMAG 1977), publishing their findings in the 1980s-90s (Kerr, Stilwell, McPhee 1977-1992). Not one single photographic portrait of a prisoner – or a photograph in any other genre, nor indeed any official, historical document – has been produced by the proponents of the Boyd misattribution since then. We asked a simple question in 2005: “Where’s the proof ?” that A. H. Boyd took these prisoners’ photographs? Less reputable voices emerged at the same time with an oppositional agenda to Kerr, Stilwell et al (Long, Reeder 1995), touting their amateur credibility to traditional photohistory commentators (Crombie, Ellis) as so much “new research” despite lack of evidence of any kind. Illogical as it seems, even more illogical was the promotion of this non-photographer A. H. Boyd into the annals of photohistory as an “artist”. The most perverse of all the Boyd apologists emerged in 2005; this was an “interpreter” of heritage at the Port Arthur Historic Site on the Tasman Peninsula called Julia Clark. From the moment she saw these weblogs about Nevin, she began her scraping and plagiarising, taking an abusive poke at Nevin and his descendants along the way, and finally publishing it all as her “own” research as yet another credited “peer reviewed reference” to notch up on the CV, one of the drivers behind this type of anxiety which pushes fraudsters such as Clark to bravado heights of intellectual theft. This is it, this is the only so-called evidence of Boyd’s photography the NLA has on file: a detail of a photograph of a corner of the image of a Port Arthur prison building with the fake inscription, not even fully visible – “Enlargement from a stereoscopic view by A H Boyd Esq.“. It is not a photograph of a man in prison clothing. It is not a portrait of a prisoner. But that’s all Julia Clark has to offer. There is nothing else. Accompanying the printed photograph is Julia Clark’s garrulous, gossipy and offensive essay, devoid of any original research by her and largely derived from ours which – with the bravado of a thief who has got something for nothing – she used to finesse her way into the hearts and minds of librarians, and supervisors of a PhD program. Above: One corner of a photograph of a building with a fake inscription is all Julia Clark has got to “prove” A. H. Boyd was a photographer of convicts. Description 1 folder of miscellaneous pieces. 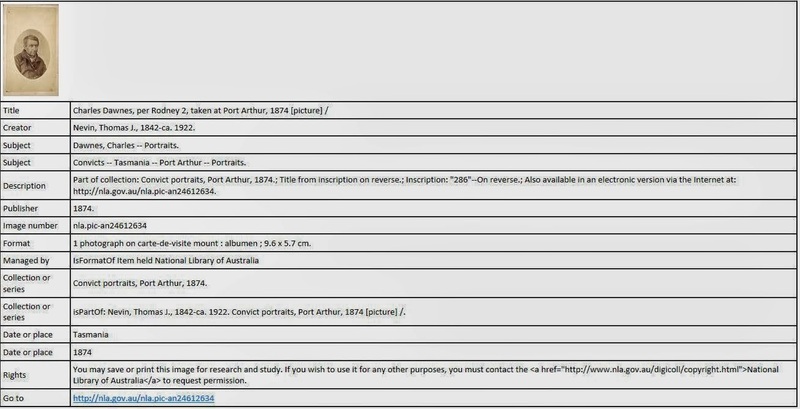 Full contents File contains material such as accession sheets, listings of works biographical material and correspondence related to convict portraits. Subjects Nevin, Thomas J., – 1842-1923. | Photographers – Australia. The “essay” by Clark pictured here is unsigned. A copy was sent to this weblog by Head of Pictorial at the NLA, Linda Groom. It contained numerous vitriolic, personal attacks on a Nevin descendant by name, who requested all such references removed from any association with this disrespectful, amateurish student called Julia Clark. A further reason for requesting all references to the Nevin descendant be removed was the attempt by Clark to insinuate some sort of collusion, even consent from the Nevin descendant. The essay, as pictured here, shows evidence of those deletions (e.g. footnote 37). 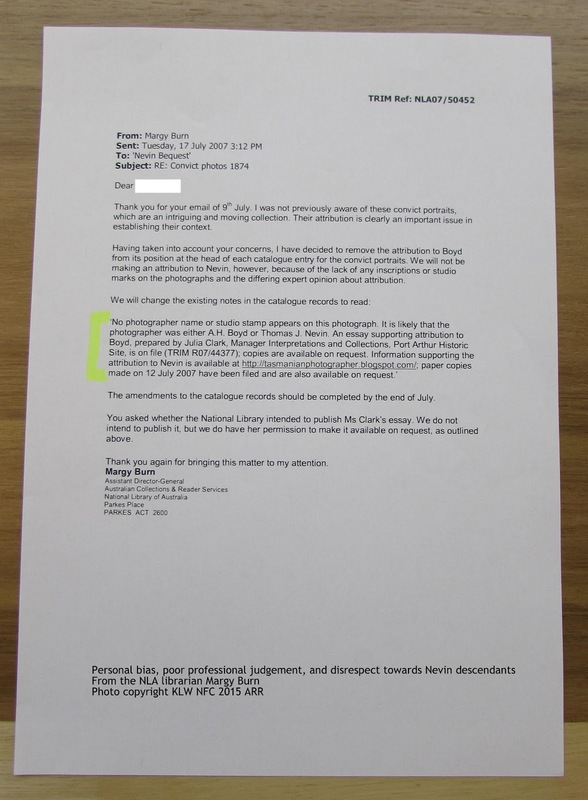 The fact that it is sitting in Nevin’s file – unsigned by Clark – is tantamount to impersonation of implied but absent and unnamed co-authors. These paltry documents by Julia Clark – the essay, more images of the fake inscription on the prison building photograph, and a copy of the subsequent “peer-reviewed” article (Journal of Australian Colonial History, Vol 12, 2010, p77-97) – are located in [Nevin, T. J. : photography related ephemera material collected by the National Library of Australia]. The “peer-reviewer” was her University of Tasmania lecturer by 2010, Hamish-Maxwell Stewart, a member of the JACH board (Murdoch University), who can best be described as the tail wagging the dog regarding the Boyd misattribution. His current role as “UTAS Research Integrity, Adviser A/Prof Hamish Maxwell-Stewart, Associate Dean, Research Arts” is like trusting the wolf to guard the hen house. Julia Clark’s “peer-reviewed” article not only accused Nevin’s descendants of being “strident” because we dared to blog about Thomas J. Nevin’s career in the age of the internet, it also adopted a tenor of cosy familiarity with Nevin family members, referring to Thomas Nevin’s brother as “Jack” which only family members used and still use. Devoid of any theoretical basis for actually reading photographic images, Clark ran a lengthy descriptive commentary on the State Library of NSW’s collection of 1870s photographs of prisoners taken by T. J. Nevin (not digitised, Mitchell Collection) which we had individually photographed for this blog in 2009. No courtesy email, no requests for permission to reproduce our texts, images and information from Clark, just the delusion that she will get away with it so long as she networks the “right people”. 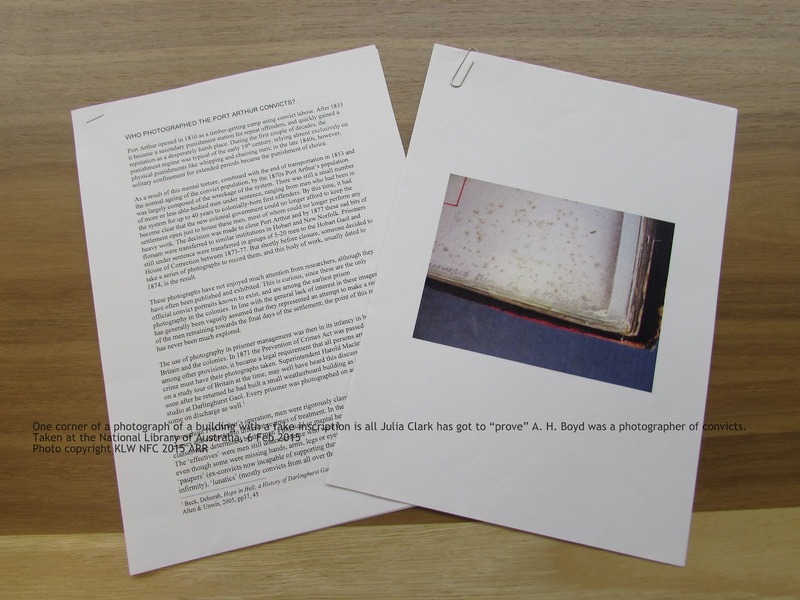 These documents by Julia Clark have been placed in Thomas Nevin’s Photographer file at the NLA as if they pertain to Nevin’s work. They don’t. They pertain to Julia Clark’s desperate ego-driven attempt to get attention from the NLA librarians to revise – in her name on their catalogue entry against each and every prisoner mugshot – their long-standing catalogue header and attribution to T. J. Nevin as the photographer of 1870s Tasmanian prisoners, which the NLA calls “Convict Portraits, Port Arthur, 1874“. Her documents should be removed instead to her own NLA file as a dead-end anomaly. She should be recognised for what she is – just another student. Creator: Nevin, Thomas J., 1842-ca. 1922. Title: Convict portraits, Port Arthur, 1874 [picture] / Thomas J. Nevin. 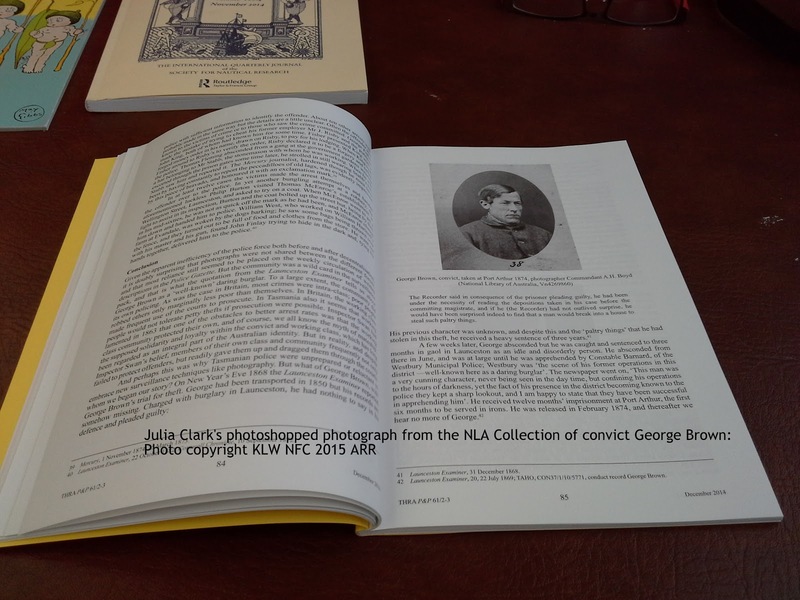 From the 1990s when these photographs of convicts first appeared on online at the NLA, the catalogue entry looked like this, with T. J. Nevin’s name in the header as creator of the library’s collection of “Convict Portraits, Port Arthur, 1874”. The letter below from librarian Margy Burn, dated 17 July 2007, indicates total ignorance of this fact. Above: a letter from NLA librarian and reader’s assistant of the Australian Collection, Margy Burn, to this weblog, who seriously suggested putting our weblog URL onto the revised online catalogue in opposition to Clark’s essay, choosing to ignore printed publications sitting on the shelves in the NLA’s Pictorial section such as The Dictionary of Australian artists : painters, sketchers, photographers and engravers to 1870, ed. Joan Kerr (1992). which document Nevin’s work (pp 568-9) and which would have been an appropriate citation. Why the online viewer needs any citational help raises serious questions about the professionalism of Margy Burn, since no other catalogue entry of the millions online at the NLA references any students’ essays. The catalogue entry as it now stands is laughable. It is an advertisement for Clark’s student essay published by the JACHS which the reader has to purchase. If ever there is evidence of corporate psychopathy, this catalogue entry against every mugshot of a Tasmanian prisoner held at the National Library of Australia has got to be it. The National Library of Australia has to face up to hard facts: Julia Clark is playing out personal, sociopathic, intellectual and emotional anxieties by committing fraud, using T. J. Nevin – and his descendants – as her focus, target and complaint. She is of “bad character” as the colonials used to say. She is also mentally unstable. In the range of syndromes where fraud is the means, her repeated attempts to make herself believable with pages and pages of drivel pilfered and masticated to her taste from the internet, and mainly from our weblogs, falls within the scope of Munchausen syndrome by proxy. As Margaret Anderson relates, Julia Clark’s Tasmanian debut took on the identity of Aboriginal activist versus the establishment. Her Baron Munchausen was historian Henry Reynolds who was accused of fabrication of black history by opponent Keith Windshuttle (1998). This episode sealed Julia Clark’s mind set of how history wars are played. Her next Munchausen by proxy episode, relevant here, was fuelled by an innocent request in an email to the Port Arthur Historic Site from a Nevin descendant for further information about a piece of Port Arthur souvenir ware, a cruet, held in the Nevin family collections. By this time, Clark had an “interpretation” job at the Port Arthur heritage site. The request, we can report from a thousand miles away with the cruet in our hands which she had never seen, was met with self-righteous, brusque responses from an openly hostile but fascinated Julia Clark, claiming her opinion was the right one. This was augmented with some totally useless, blurry photographs of a tea set sent to us “courtesy of…” which of course we ridiculed. She knew then she had found her next complaint, the very ordinary but very real 1870s commercial and police photographer Thomas J. Nevin, one with biographers (conveniently deceased) and a curatorial history, not to mention descendants, those mainlanders with such a culturally significant name and legacy. If the Henry Reynolds-Keith Windshuttle episode had shown Julia Clark what mind-set and modus operandi to adopt with regard to brawling with the establishment over Tasmanian Aborigines, she now had a good excuse to get closer to Reynolds by enrolling in a PhD at the University of Tasmania under his co-supervision, this time using convicts in the oppositional dialectic of convict versus photographer, criminals versus clean-skins, working class versus colonial middle class, government official (i.e. 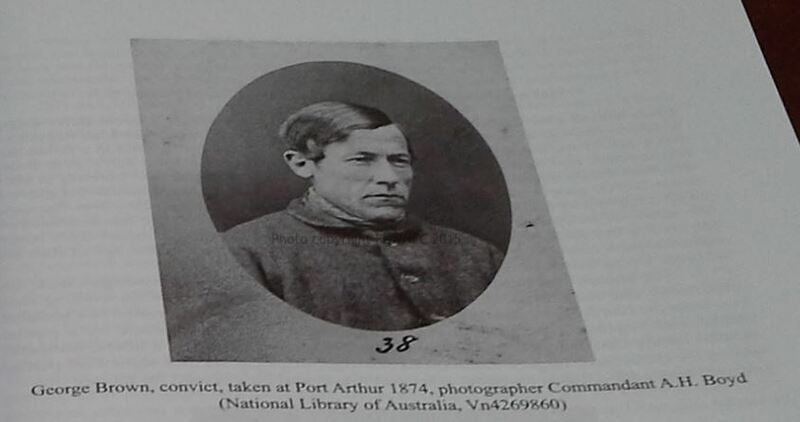 her man of the match, Commandant A. H. Boyd), versus the artist photographer: or, as it played out, it became Clark and the convicts and bosses of the Port Arthur prison heritage site (past and present) versus Nevin’s convicts’ photographs, their custodians in the public collections, and Nevin’s descendants. An Historical Novel Based on True Events that Never Happened. Fraud begets fictions, no matter how true they become in the minds of believers. The Munchausen figure Julia Clark next turned to for control by proxy of her complaint was the publisher of the Boyd furphy, list-maker of an A-Z guide to Tasmanian photographers 1840-1940 (TMAG 1995), a ham radio enthusiast from Melbourne called Chris Long. His A-Z index was not simply copied from substantial previous photohistories (eg Kerr et al, Alan Davies etc), his own anxieties at being regarded as a pretentious fraud and plagiarist were projected onto Julia Clark with such force, she has become his mouthpiece – that is, in the rare moments when he isn’t ranting and raving over the air waves or on Facebook with all manner of foul abuse. His nonsense has compromised a generation of students interested in forensic and historical police photography, especially Melbourne dealer and NLA valuer, Warwick Reeder. Henry Poincarre claimed that science, like a house, is built of bricks. Such bricks are said to be objective, value-free observations of unbiased, disinterested (though never uninterested) individuals. It isn’t. It is an intensely human enterprise, subject to all the ambitions, jealousies, animosities, prejudices, and even sense of fun, of its participants…. In psychiatry, there is a rare condition called Munchausen Syndrome, which involves repeated fabrication, or pretence of physical illness, usually acute, dramatic and convincing, by a patient who wanders from hospital to hospital seeking treatment, and attention. Patients may simulate many physical disorders, and bear the scars of repeated, unsuccessful, surgery; they are usually intelligent and resourceful, and differ from malingerers because, although their deceits and simulations are conscious, their motivations for forging illness and quest for attention, are largely unconscious. Munchausen Syndrome by proxy is an even more bizarre variant, where the individual’s child may be used as a surrogate patient; the parent may even injure the child to simulate disease. I wonder whether, one day, someone will turn up familial Munchausen Syndrome by proxy, perhaps even involving pets? Maybe it’s no coincidence that Munchausen Syndrome is anyway, itself a kind of fraud. This weblog has documented Julia Clark’s fraud as a PARASITIC attribution, perhaps too kindly, since her latest fraud offense is bolder than ever, but it might just elucidate Julia Clark’s fraudulent behaviour to the crowd she has gathered as her campaign of defamation of Nevin’s descendants escalates incrementally towards … what? Climax/finishing the thesis/graduation/ winning the game/ relieving the itch? Is it going to happen? It’s very doubtful. Fraud is a serious issue. Nonetheless, quite sure in her mind now that she has succeeded in making everyone in the museum and library business believe that A. H. Boyd was not only a photographer when there is no evidence to be found anywhere, but also THE photographer of convicts, Julia Clark has used the Tasmanian Historical Research Association as her fall-guy by persuading them to publish an essay in their December 2014 journal issue. Her refrain in every article, and in this one too, is that if she can’t find a document, it never existed in the first place. This deception neatly covers her laziness in not searching for authentic historical archival documents in libraries and museums, and her assumption that if the information isn’t visible on our weblogs, we haven’t found any either, which indicates clearly our weblogs as her primary sources. Her article shamelessly scrapes our Nevin weblogs (we recorded her three thousands clicks on our article about Henry Singleton), and fills up page after page with mindless trivia about police and and petty crime, until it gallops to the conclusion with the only reason for writing it at all: to include her mutilated copy of a photograph of a convict called George Brown, with her own attribution to A. H. Boyd, and source as the NLA’s digital code URL nla.pic-vn4269860, the original of which has been online at the National Library of Australia since the 1990s. 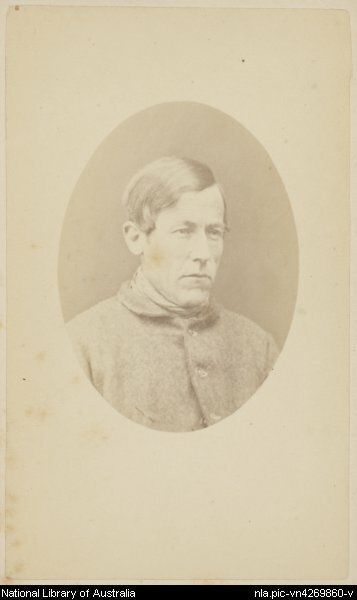 This is the NLA’s one and only photograph of prisoner George Brown, taken by Thomas Nevin at the Municipal Police Office in February 1874 on Brown’s discharge from the Hobart Gaol. The full record online reflects Julia Clark’s anxiety at not getting enough attention – as a student! Extent 1 photograph on carte-de-visite mount : albumen ; 9.4 x 5.6 cm. on mount 10.5 x 6.3 cm. Series Convict portraits, Port Arthur, 1874. Notes No photographer name or studio stamp appears on these photographs. Formerly attributed to Thomas J. Nevin, the portraits are now considered more likely to have been taken by A.H. Boyd. See: Julia Clark. 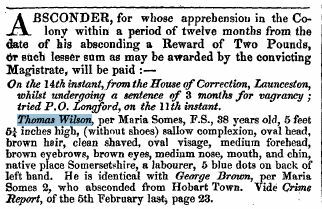 A question of attribution: Port Arthur’s convict portraits in Journal of Australian Colonial History, Vol 12, 2010, p77-97. Inscription: title and “150”–In ink on reverse. Subject Brown, George — Portraits. Convicts — Tasmania — Port Arthur — Portraits. Boyd, A. H. (Aldolarius Humphrey), 1829-1891. Warrant for the arrest of George Brown per Maria Soames, 5th February 1869. Warrant for the arrest of Thomas Wilson identical with George Brown per Maria Soames, 18th June 1869. George Brown as Thomas Wilson was photographed on discharge from the Hobart Gaol by Thomas J. Nevin, 11 February, 1874. Source: Tasmania Reports of Crime Information for Police 1871-1885. J. Barnard, Gov’t Printer. This is the modified photo which Julia Clark has photoshopped and published with the fake number “38” on the front, attribution to her fantasy photographer Commandant A. H. Boyd, and NLA identifier URL nla.pic-vn4269860. George Brown was not sent to Port Arthur, nor was he exposed to the reviled bully A. H. Boyd in any context. Julia Clark’s photoshopped photograph from the NLA Collection of convict George Brown with fake “38” transposed on recto; false attribution to A. H. Boyd, and Port Arthur as the wrong place of incarceration. There is only ONE photograph of George Brown at the NLA – we checked the entire collection in situ on Friday, 6th February, 2015. So why has Julia Clark photoshopped the NLA photograph? Does excessive anxiety about the false A. H. Boyd attribution warrant such obsessive mutilation? She has put the number “38” on the front of the photograph of George Brown where there is no number on the NLA item. 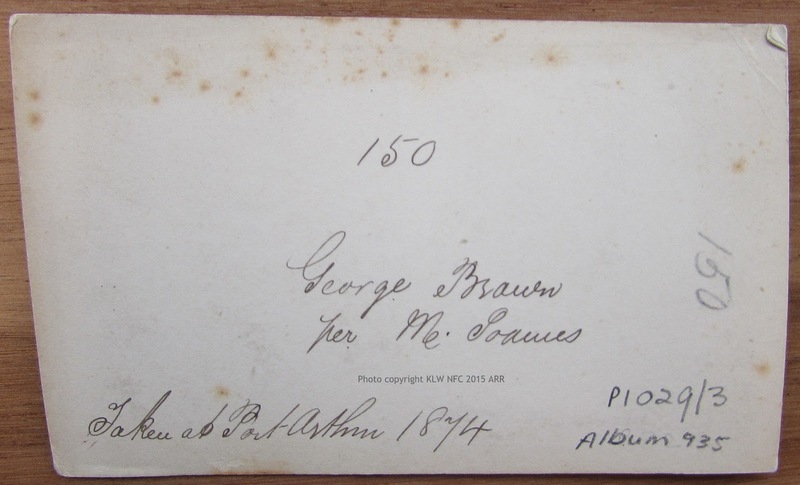 On the verso of the NLA photograph of George Brown is the number “150”. And the only photograph of a convict at the NLA which bears the number “38” is that of Duncan McDonald on its verso. 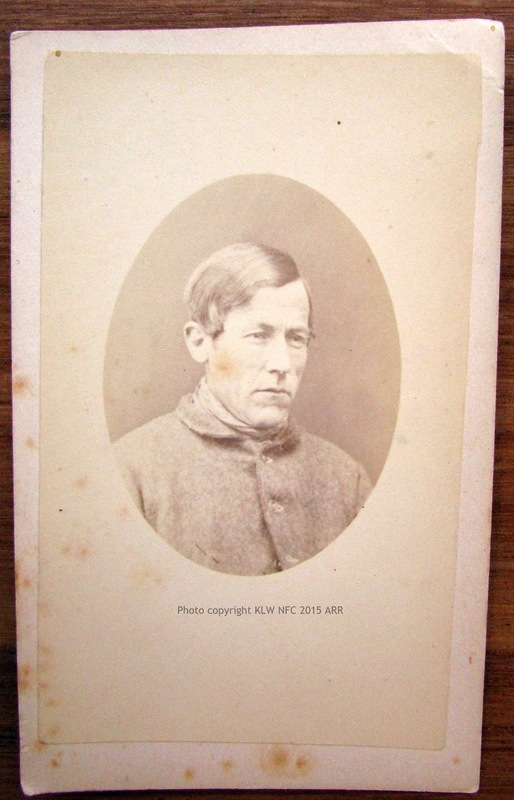 The QVMAG holds a cdv photograph of convict Thomas Jackson per Layton 4 which bears the number “38” on the recto, written on the front by 20th century archivists during copying and dispersal of hundreds of these cdvs to other public collections (complete list received here in 2009). The number “38” on Clark’s photoshopped image is bright black. It was constructed from the numbers on the recto of other photographs of prisoners – the “38” from the “138” of George Robinson’s and the “3” from Bewley Tuck’s held at the QVMAG (we can back track this process easily to each number and photo) – thereby committing a modification of an image belonging to the National Library, by fraudulent means, for fraudulent purposes. Verso of the NLA photograph by Thomas J. Nevin, February 1874 of prisoner George Brown as Thomas Wilson. The essay by Julia Clark in this issue of the THRA journal, December 2014, directly follows a memoir by the former Governor of Tasmania, Sir Guy Green, AC, KBE, CVO who was the Governor of Tasmania from 1995 to 2003. He was the first Tasmanian-born governor of the state, although not the first Australian-born. How shameful for the THRA to be the victim of Julia Clark’s fraudulent pretensions in such illustrious company. Moral rights should always be considered if you are re-using and altering works (for example, through editing, cropping or colourising) and you should ensure that attributions are clear and reasonably prominent.